Carboxytherapy, also referred to as carbon dioxide therapy or CDT is becoming more widely used within UK aesthetic clinics. The therapeutic and medical use of carbon dioxide has now been used by the medical community in Europe since the 1950s. The most common aesthetic indications for treatment with carboxytherapy are for cellulite and localised fat reduction, stretch marks (striae), acne scars, skin laxity and wrinkle reduction. Treatments are generally performed on the face, neck, arms, abdomen and thighs. Carboxytherapy uses a series of small injections with a thin needle attached to a tube which delivers tiny quantities of medical grade carbon dioxide below the skin’s surface in a controlled flow and dose via a specially designed machine. Depending on the area being treated, you should expect to pay approximately £100 per session of carboxytherapy, with reduced fee packages available from most private clinic providers. The CO2 Riojuvenation System from Rioblush is used for the treatment of Carboxytherapy to target stretchmarks, fine lines and wrinkles, dark under eye circles, cellulite and localised fat deposits as well as minor skin tightening of the neck and decollete regions. Carboxytherapy, also referred to as carbon dioxide therapy or CDT is becoming more widely used within UK aesthetic clinics. But how can a gas that we are regularly told by the news media we should all be trying to reduce our production of, because of global climate change, be applied medically for skin rejuvenation and cellulite reduction? Carbon dioxide is, as its molecular name states, made up of one carbon atom (C) and two oxygen atoms (O), hence CO2. It is an invisible and odourless gas produced by all humans and animals during respiration or breathing and is conversely absorbed by plants and trees for use in a process called photosynthesis, which aids their growth and in turn produces more oxygen for us to breathe. CO2 is also produced by the burning of fossil fuels, such as in car exhaust fumes and in the production of electricity from coal fired power stations; hence the concerns regarding its over production and our so called ‘carbon footprints’, which have led many large producers to try and offset their carbon dioxide production via the planting of more forests. Despite its often noted potential harmful effects in terms of being a greenhouse gas, it does have many uses and applications within the food, oil and chemical industries, such as in carbonated drinks, raising agents for baking, fire extinguishers, industrial and medical lasers and dry cleaning solutions. It also has properties which make it useful to the medical community. One such property is its vasodilatory ability, i.e. the ability to relax the muscles in blood vessels and allow them to dilate or expand. The dilation of blood vessels leads to a decrease in blood pressure and a better flow of oxygen rich blood around the body. The beneficial effects of carbon dioxide on health were first discovered in France in the 1930s when it was noted that bathing in the pools of carbon dioxide rich water at the Royal Spas helped to speed up wound healing. Carboxytherapy, (the therapeutic and medical use of carbon dioxide), has now been used by the medical community in Europe for over 60 years, having been investigated in France in the 1950s by a group of cardiologists (heart specialists) who used the therapy to treat patients with various illnesses caused by blood circulation and fat accumulation problems in their arteries. Subsequently the therapy was applied to patients with cellulite problems, where circulation is known to be sluggish, and is now widely used for a variety of other aesthetic indications in Europe, and North and South America. If you are considering carboxytherapy the following information will give you a basic understanding of the procedure. It can't answer all your questions, since a lot depends on the individual patient and the practitioner. Please ask a practitioner about anything you don't understand. The human body is made up of many different types of cells within our major organs and our skin. They all perform different jobs, but all require energy to do so which they take in the form of the oxygen and then create carbon dioxide as a waste product. Every time we breathe in oxygen to our lungs the oxygen is picked up by the red blood cells that are in the tiny blood vessels within our lungs. Each red blood cell can carry four oxygen molecules which it takes from the lungs to the heart via the blood vessels. As the heart beats it forces these blood cells into the arteries and on a journey around the body to where they’re needed. When they encounter an area with high levels of carbon dioxide, which has been created by the hard work or cellular metabolism of some particular cells, the red blood cells drop their oxygen molecules to ‘feed’ these cells and picks up the carbon dioxide that they have produced. They then carry the carbon dioxide back to the lungs and we exhale to get rid of it. We then breathe in more oxygen and the whole process starts again. Imperfections on our bodies such as dark under-eye circles, scarring and cellulite are thought to be caused, in part, by the poor circulation of blood to those areas, and therefore a poor supply of oxygen. Carboxytherapy is said to work simply by tricking the body, as by injecting a small amount of carbon dioxide gas into the area, it will increase the dispatch of oxygen laden red blood cells to the area to pick up the new ‘waste’ carbon dioxide which the body will then naturally eliminate via the lungs over time. By increasing the amount of oxygen getting to the area the cells will become more active and thus speed up any healing or new cell production required to rejuvenate the area. The most common aesthetic indications for treatment with carboxytherapy are for cellulite and localised fat reduction, stretch marks (striae), acne scars, skin laxity and wrinkle reduction. Treatments are generally performed on the face, neck, arms, abdomen and thighs. What happens during a Carboxytherapy treatment? Your first discussion with a practitioner should clearly set out your expectations and what the practitioner thinks will happen to your skin as a result of carboxytherapy. A medical history should be taken, to ensure that there are no reasons why you shouldn’t have the treatment, and you would normally be asked to sign a consent form at this time which means that you have understood the potential benefits and risks associated with carboxytherapy. Carboxytherapy, as performed in the aesthetic clinic setting, is similar in nature to the technique of mesotherapy, but is used to infuse tiny quantities of medical grade carbon dioxide gas below the skin’s surface rather than tiny quantities of a liquid formulation. It is done using a series of small injections with a thin needle attached to a tube which delivers the gas in a controlled flow and dose via a specially designed machine. Depending on the area treated, it may be possible to see the gas as it travels within the surface layers of the skin as a minor protrusion. In the case of treating cellulite, the carbon dioxide is delivered deeper into the subcutaneous layer of the skin. A topical anaesthetic can be applied to the skin if required for comfort. 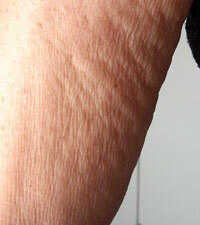 In the case of treating stretch marks, it is said that these respond better to treatment when they are most recent and still red in colour, rather than when older and of a more faded, silvery appearance. Newer striae will most likely require to be treated once a week for 2 – 4 weeks, although in some cases a single session is enough, depending on their severity. 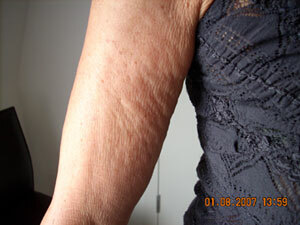 Older stretch marks will need 3 or 4 treatment sessions at 3 - 4 weekly intervals. In the case of cellulite reduction, the introduction of the CO2 under the skin is combined with manual massage to help evenly distribute the gas and make it circulate within the tissues. When it comes into contact with the fat cells, it is claimed that it can literally kills them by stimulating a metabolic reaction of fat burning mechanism within the body. The vasodilatory effect in the small blood vessels surrounding the fat cells increases the amount of oxygen and blood flow to the area which eliminates the build up of fluids and toxins between the cells causing lymphatic drainage, and also improves the elasticity of the deeper skin areas by stimulating the production of new collagen, leading to a rejuvenation in the upper layers which reduces the tight, cottage cheese or orange peel look to the skin associated with cellulite. 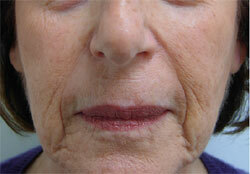 Results are said to be seen immediately, with an improved and smoother look to the skin. As the blood circulation improves and the natural fat burning continues, the area becomes firmer over time with a reduced circumference, although multiple treatment sessions and top-up maintenance sessions every 6 months will be required. How long will it take to recover from Carboxytherapy? What are the risks and potential complications from Carboxytherapy treatment? Treatment is generally said to be fairly painless, although some people will feel a slight discomfort, pressure or stinging sensation as the gas is delivered to the tissues, sometimes described as a ‘crackling’ sensation, depending on the area treated. A topical anaesthetic can be applied to the skin if required. Side effects include minor swelling, redness (caused by the vasodilation), bruising and pain at the injection sites lasting anywhere from 1 – 5 days, depending on the area treated, and in the case of cellulite treatment a warm sensation in the region for up to 24 hours. What should you do after a Carboxytherapy treatment? It is important that you follow the advice of your practitioner carefully after carboxytherapy treatment. This will help you to gain maximum effect from the procedure and reduce the risk of any complications. Bathing or swimming should be avoided in the first few hours after carboxytherapy treatment. Who should not have a Carboxytherapy treatment? Who can perform a Carboxytherapy treatment? Manufacturers recommend that only medically qualified practitioners should use these treatments. Thus you will find many nurses, as well as general practitioners, dermatologists, and surgeons using this treatment. Manufacturers do not recommend that beauticians or any other person outside the medical profession use carboxytherapy. What is the average cost of Carboxytherapy? Depending on the area being treated, you should expect to pay approximately £100 per session of carboxytherapy, with reduced fee packages available from most private clinic providers. Despite the wide variety of indications which carboxytherapy is able to turn its hand to, it seems that the vast majority of data collected and treatments performed are for the reduction in the appearance of cellulite and fatty tissue. Clinical data on the use of carbon dioxide for aesthetic indications is currently quite limited, although there are some key studies emanating from Europe and South America which shed significant light on its efficacy in the treatment of fatty tissue. In 2001, a study from the University of Siena in Italy looked into the treatment of localised fat deposits on the thighs, knees and/or abdomen in 48 women using carbon dioxide therapy. The CO2 was administered subcutaneously twice weekly for 3 consecutive weeks, i.e. a total of 6 treatment sessions. Results showed that on average the women lost 2cms of circumference from their thighs, 1cm from the knees and almost 3cms from the abdomen. The skin in the treated areas also presented a thicker appearance than before treatment, with cellulite appearing smoother. Few side effects were observed; although of those noted, such as the presence of a crackling sensation under the skin (reported by all patients), pain at the injection site (reported by 70% of patients) and slight haematomas (reported by 30% of patients), all resolved very quickly. A later study from the same University published in 2004 looked at the effects of carbon dioxide on skin irregularity and its use as a complement to liposuction. It evaluated the treatment of 42 patients treated for fatty tissue accumulations on the thighs and knees. The group of patients were divided into three groups, in one group only liposuction was performed, in the second carbon dioxide therapy was administered 3 weeks after liposuction was performed in twice weekly applications for 10 consecutive weeks, and in the third group carbon dioxide therapy alone was administered, again twice weekly for 10 consecutive weeks. The results were then analysed by reporting on variations in circumference measurements and skin elasticity after 2 months. The authors noted that liposuction alone did not generally have a positive enough effect on skin irregularity and could in fact cause uneven areas, however the addition of carbon dioxide therapy provided an improvement in skin smoothness and elasticity, meaning that in their opinion it offers a good complement to liposuction procedures. CO2 therapy also showed positive results in reducing fat accumulation as the circumferential measurement results of those treated with liposuction and carbon dioxide were better than for those treated with liposuction alone. A study from Brazil published in March 2008 looked at whether the intradermal and subcutaneous injection of carbon dioxide into the skin of rats would increase the turnover of collagen. Following biopsies it was noted that collagen turnover had indeed increased as compared to the control animals (which were injected with saline) and that the collagen formations were more pronounced in the areas where the gas was injected intradermally as compared to where it was injected subcutaneously. The authors noted that the results obtained corroborated clinical observations of aesthetic improvements in human facial skin injected with carbon dioxide but that future clinical studies were needed to address the comparison between intradermal and subcutaneous injection methods as well as the volume of gas to be used and the frequency of treatment sessions. As this treatment becomes more popular in the UK, and perhaps the USA, it is hoped that more studies of this kind will be done on the various potential aesthetic indications for carboxytherapy. Treatment with carboxytherapy is still very new in the UK in terms of the number of practitioners offering the treatment and those suitably skilled and trained to carry out the procedure. In general, as this treatment is more popular in Europe and has origins in France, many of those doctors practicing in the UK are indeed French. Two such doctors, Dr Daniel Sister and Dr Cyrille Blum, both with clinics based in London, have kindly provided some case studies to illustrate the wide range of treatment indications and results achievable with the aesthetic application of carbon dioxide therapy. 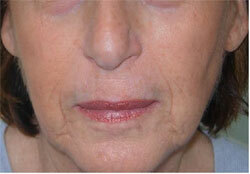 Nasolabial folds and marionette lines on the face (before on the left, after on the right) treated with 12 sessions of carboxytherapy, twice a week for the first 3 weeks and then once weekly for 6 weeks. Images © Copyright Dr Cyrille Blum, London, UK. Stretch marks on the abdomen (before on the left, after on the right) treated with 4 sessions of carboxytherapy over 4 months. Stomach (before on the left, after on the right) treated with 10 sessions of carboxytherapy, twice per week for the first 2 weeks then once weekly for 6 weeks. 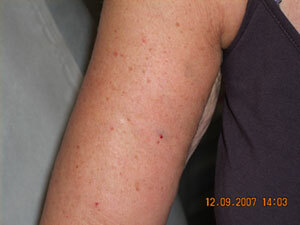 Arm (before on the top left, close up on the skin in the top right and after below) treated with 5 sessions of carboxytherapy, once per week. Images © Copyright Dr Daniel Sister, London, UK. Click for ALL Carboxytherapy clinics in the UK & Ireland registered and verified by Consulting Room.